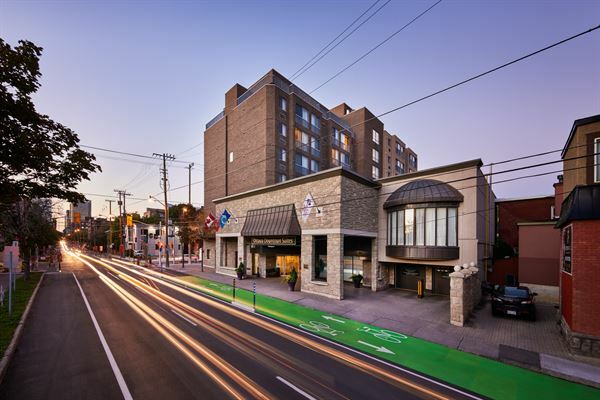 Experience the richness of the Best Western Plus Ottawa Downtown Suites, just a few blocks south of Parliament Hill and the downtown business district. Our versatile meeting facilities consist of two fully divisible salons and a boardroom, which can be easily set up to accommodate groups of 10 to 170 guests. Whether it's for business or a social gathering, we are able to look after all your needs. From catering requirements to audio/visual equipment, it all can be arranged by our meeting and sales coordinator. Set Boardroom that can accommodate up to 12 guests. Rental includes unlimited highspeed wireless internet, a screen, water service, notepads and pencils. We do not charge setup fees, patching fees or gratuities. On site catering is available starting at a minimum order of 10 people. Salon that can be divided into two separate spaces, private entrance, coat room, private bathrooms and separate foyer. Rental includes unlimited highspeed wireless internet, a screen, water service, notepads and pencils. We do not charge setup fees, patching fees or gratuities. On site catering is available starting at a minimum order of 10 people. Salon that can be divided into two separate spaces, with access to an outdoor patio area. Rental includes unlimited highspeed wireless internet, a screen, water service, notepads and pencils. We do not charge setup fees, patching fees or gratuities. On site catering is available starting at a minimum order of 10 people. Salon that can be divided into two separate spaces. Rental includes unlimited highspeed wireless internet, a screen, water service, notepads and pencils. We do not charge setup fees, patching fees or gratuities. On site catering is available starting at a minimum order of 10 people. Special Features: Meeting rentals include unlimited, highspeed, wired or wireless internet, flipcharts, water service and linens. We do not charge service fees or gratuities.